Get any two business people talking about printing and within minutes they'll be bemoaning ink and paper costs. The price of the printer is a one-off and soon slips into the mists of office history, but constant replenishment of consumables keeps reminding you of the true cost of printing. It's a cost you can't avoid completely and is directly proportional to the number of documents you print. But there are things you can do to mitigate the costs, some of which are free and others cost little. There are a number of features built into virtually every printer that can be used to reduce running costs. Which ones you choose to use are up to you, but all will control the use of one of two things: ink or toner and paper. The largest savings are in reducing ink/toner use, and the most obvious step is to use draft print mode wherever possible. This is a setting in the print driver, which can be accessed, for example, through the small Print Properties link on the Print page of recent versions of Word. Draft mode works by printing selected dots from the full matrix that's printed in normal print mode. This gives a lighter and dottier appearance to text, but in most cases, it's still perfectly readable and is fine for day-to-day office use. It usually increases print speed too, so there's a double gain. Some printers offer an 'ink-saver' or 'toner-saver' mode instead of a true draft, which isn't normally quicker than normal print and some, particularly older Epsons, use a different default font for draft text print, which may make slight changes to the layout of pages. You can save money by using third party inks and toners, although printer manufacturers try to deter this by voiding warranties and linking their cartridges to their machines electronically. 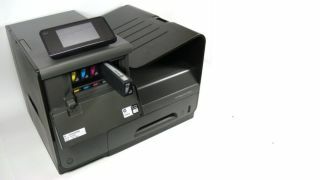 From our testing, we consistently see better quality print using manufacturer's cartridges than with third parties, but some third party products, like those from www.stinkyink.co.uk, come close. If you print a lot of documents, paper costs will also mount up, with a ream of paper typically costing between £3 and £5. But paper savings are also easy to achieve on most printers. More and more machines offer duplex print, where pages are printed on both sides of the paper. Each time you print duplex, you save close to half your paper costs, between 0.5p and 1.0p per page, depending on paper. For internal office documents, you can also print more than one page per sheet. Most printers have facilities to do this automatically and printing even two pages per sheet, where for instance you print two A5 page images on an A4 page, is a useful saving, over time. Multiple pages per sheet require original text at a reasonable size, otherwise it can be hard to read. Combining duplex and multiple pages can also work well. A long, single-side A4 document can be reduced to a two-sided A5 booklet, saving 75% of the paper in the process. It may be obvious, but you can always save money by looking at the cost when selection papers. Don't feel you have to use specialist inkjet or laser paper for day-to-day work; many cheaper papers work well, including multi-use types, designed to work in both types of printer. Buying one paper for all your office printing can provide extra economies of scale. If you want to use draft print but your printer's draft output is particularly dotty or poorly formed, you could use EcoPrint 2. This is a commercial program, costing $40 (£26.50), or $60 (£40) for the Pro version, which provides a good quality draft print for which you can select the amount of ink/toner saving you want. With savings of between 10% and 50% it gives lighter prints, but with very little degradation in the quality of text and graphics. If you have sufficient funds, it's always worth buying the high capacity XL versions of cartridges. Although these can be up to double the cost of the regular consumables, they give back more than this in extra pages printed. As well as checking that any new printer you're considering supports features like duplex print and multiple pages per sheet, you should do a little calculation. In general, the higher the asking price of the printer, the lower the running costs per page. What you need to know is how many pages you'll have to print to make back the extra cost of a more expensive printer. Here's an example: say you print about 1,500 pages a year, made up of 1,000 black and 500 colour. You're considering two printers (we'll use inkjets in this example): one costs £130, with page costs of 3.7p black and 11.9p colour, including 1p paper; the other costs £190, with pages costs of 2.1p and 5.3p. Over the three years life of your printer, the total cost of ownership (TCO) of the first will be £420, while the second will have a TCO of £333, nearly £90 less. If you keep your printer more than three years, or print more than 1,500 pages per year, the difference will be even greater. Using these few, simple ideas, you can make significant savings to your overall printing costs. You needn't feel so much at the mercy of suppliers who know the real money is not in the printer, but in its inks or toners.